Twelve years after Oakland's beloved sports announcer died, fans can still revisit King's greatest game calls for the Raiders, Warriors, and A's - thanks to BayAreaRadio.org. Check out some of Bill King's most memorable calls on BayAreaRadio.org. 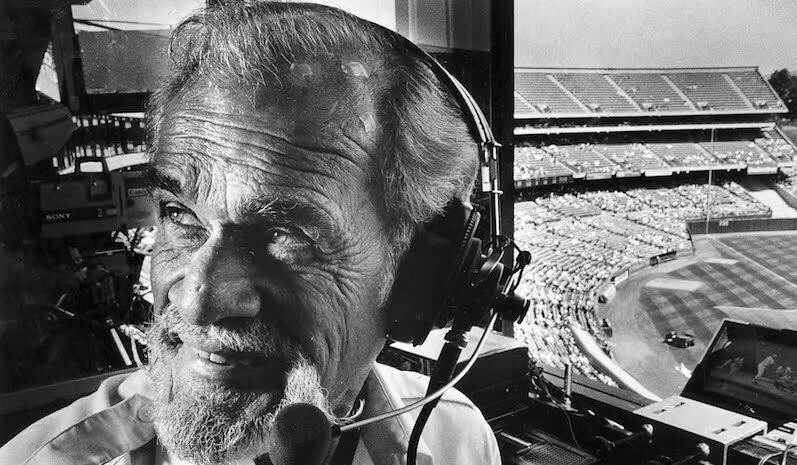 A familiar Oakland fan debate about the late great Bill King centers on whether the announcer was better at calling games for the Athletics or for the Raiders. It's a trick question because, in my opinion, King was at his best behind the mic for the Warriors, for whom he called NBA games from 1962-83. In his prime, King's rapid-fire delivery and volatile emotion fit perfectly with basketball's fast-paced twists and turns. The NBA's oft-questionable officiating also made the perfect target for King to aim his fiery temper. And his infamous "Mother's Day" call, in which King hurled an on-air expletive at referee Ed Rush, is a prime example of his fierce anti-authoritarian streak. That late 1968 broadcast took place about five months before the next Mother's Day, which should give you a clue about which curse word the mic caught King screaming at the NBA ref. It's a shame that younger fans haven't had the chance to hear the broadcasting legend's stellar work. But now they can at least get a sample of it at BayAreaRadio.org - the online home of the Bay Area Radio Museum and Hall of Fame, which celebrates all things tied to vintage local airwaves. The nostalgic website has articles, video interviews, and web links featuring old-school radio stations, deejays, and programs. The site also offers past game broadcasts of Bay Area sports teams, from current pro franchises to long-defunct ones like the San Francisco Seals of the Western Hockey League. East Bay native David Ferrell Jackson - founder and executive director emeritus of the Bay Area Radio Museum and Hall of Fame - said he has culled together the vast majority of the website's broadcast links. And he's done a great job curating the museum's lost audio treasures; the sampling of King's play-by-play work showcases his greatness. You don't have to be a Raiders fan to enjoy the audio snippet of the thrilling and bizarre "Holy Roller" victory in 1978, for example. Sure, you can find some great King moments on YouTube. But if younger Warriors fans really want a taste of King's brilliance at the peak of his career, they can click on a link that will transport them back to Nov. 25, 1977, when the Golden State Warriors battled the Philadelphia 76ers at The Spectrum in Philly. In that game, Rick Barry, Clifford Ray, and Phil Smith lead the Dubs against a Sixers team stacked with legends, like Julius "Dr. J" Erving, George McGinnis, and Lloyd Free - who would join the Warriors a few years later and rechristen himself, "World B. Free." It's been an unusually intriguing NBA season. As the Warriors head into the All-Star break, notable subplots and challenges are popping up around the league. Boston, which has given the Dubs fits the past few years, is still going strong. And Toronto, led by DeMar DeRozan, has been on a tear, challenging the Celts for the East's best record. Cleveland's big trade-deadline deals reeked of desperation, but LeBron and the Cavs actually seem to be rejuvenated by them. Lastly, the Houston Rockets, who barely trail the Dubs in the standings, are nearly undefeated when James Harden, Chris Paul, and Clint Capela play together. Houston is a legitimate threat to the Dubs' title hopes. Meanwhile, the Warriors seem to be playing on cruise control, exerting little consistent energy on defense and sleepwalking through a few recent losses. The path to another title for Oakland's Warriors has never been this crowded. Is it time for Dub Nation to worry?